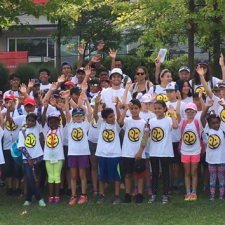 Thursday July 21st was an exciting afternoon for 25 Philpott campers from our Oakridge and Secord Community Centre sites. 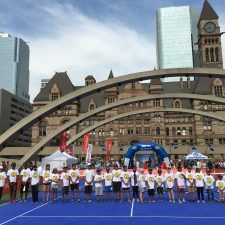 These children were welcomed on to a temporary centre court at Nathan Phillips Square (Toronto City Hall) and treated to an extra special tennis lesson. The lesson was given by the famed Rogers Cup announcer Ken Crosina and he made sure the on court time was both instructive and fun. 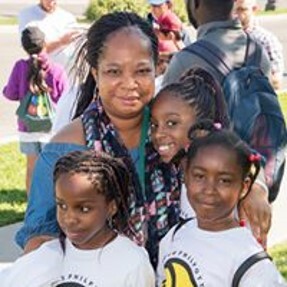 Each child received a Philpott t-shirt, a tennis ball key chain and two tickets to the Rogers Cup for the evening session on Monday July 25th. Several families stayed on to see Canada’s own tennis star Milos Raonic come and play on the very same court against the Toronto Mayor John Tory. Mayor Tory was no match for our Canadian superstar. Many thanks to Tennis Canada for including the Philpott campers in this terrific event and thanks again to Ken Crosina for making the experience so much fun!